Chobe is most famous for its elephant population, which is estimated at around 100,000 elephants - the highest concentration of elephants to be found anywhere in the world. The Okavango Delta is a unique wetland area in the northern part of Botswana, and contains 95% of all of Botswana's surface water. The Makgadikgadi Pan comprises of 3 separate salt pans which together cover 12,000 square kilometres of the north-eastern part of Botswana, making this the largest collection of salt pans in the world. The Central Kalahari Game Reserve is the largest game reserve in Botswana and is made up of open plains, which sit alongside salt pans, ancient river beds, and sand dunes, making for a varied and interesting landscape. Botswana will surpass your wildest dreams of an authentic African wildlife experience. Rated as one of the best wildlife destinations in the world, Botswana covers an area of almost 600,000 square kilometres – virtually the same size as France or Texas. Bordered on all sides by its neighbours Namibia, South Africa, Zambia and Zimbabwe, this completely land-locked country is mostly desert - in fact, three-quarters of Botswana is classified as desert. 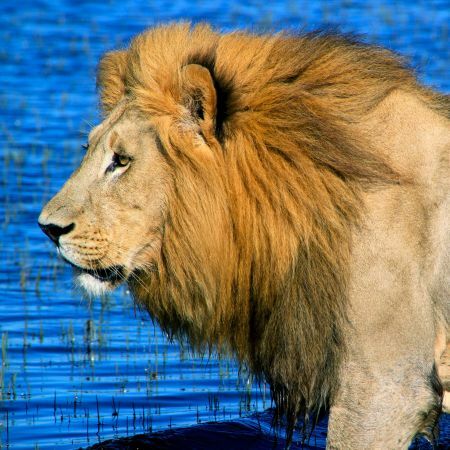 Botswana’s main safari attraction is the world-famous Okavango Delta which is situated in the northern part of the country. The Delta is the world’s largest inland wetland area, comprising of nearly 16,000 square kilometres of lagoons, island and channels. This great quantity of water attracts a huge number of wildlife, including elephant, buffalo, zebra, giraffe, hippo, kudu, predators such as lion, wild dog, hyena and leopard, and endless birdlife. Visitors to this area can luxuriate in some of the finest safari lodges, and explore the pristine environment by game vehicle or mokoro (a traditional dug out canoe). 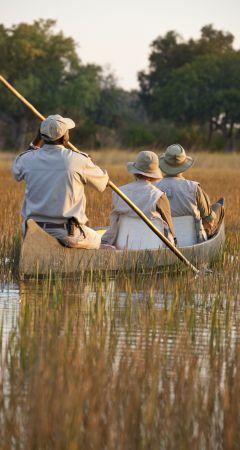 The mokoro is a gentle, quiet and unobtrusive way to experience Botswana's waterway wilderness. The high levels of water in most areas of the Delta occur after the annual rains, so between May and August is widely regarded as the best time for a mokoro safari. To the far north-east of the country lies the Chobe National Park, covering an area of nearly 11,000 square kilometres. Made up of a variety of habitats including waterways, marshes, riverine forests and dry woodlands, Chobe is renowned for its large elephant population, where herds in excess of 200 can often be sighted during game drives. Huge herds of buffalo, zebra and lechwe (a type of antelope) are also common sightings, as well as lion, leopard and hyena. The area is also renowned for its rich birdlife. For returning visitors or those with a bit more time, the Linyanti Wildlife Reserve definately a worthwhile addition to anyone's Botswana itinerary. Linyati is 125,000 hectares of pristine wildlife area and is one of the least visited areas in the country - it is extremely picturesque and home to a high concentration of wildlife. Or if you want something unique, consider a 5 day canoe trail in the Selinda Concession. The Makgadikgadi Pan covers 12,000 square kilometres of the north-eastern part of Botswana, and is one of the largest salt flats in the world. During the annual rainfalls in November, the area is transformed into a lush green desert, teeming with thousands of wildebeest, zebra and antelope who migrate here in search of water. The Central Kalahari Game Reserve is the largest game reserve in Botswana, and is characterised by open plains, salt pans, ancient river beds, and sand dunes, making for a varied and interesting landscape. The vast open plains burst into life at the first rainfall, and huge herds of wildebeest, springbok, oryx, eland and kudu congregate, under the watchful eyes of predators such as cheetah, wild dog, jackal, leopard, hyena and lion. The area is also home to the Bushmen, who have inhabited the land for thousands of years. The capital of Botswana is Gaborone, although most visitors to Botswana will also encounter Maun, as this is the 'gateway' for all trips to the Okavango Delta, or Kasane, as most trips to the Chobe National Park will start and end here. There are daily flights from Johannesburg to both Maun and Kasane, and also a daily flight between Maun and Cape Town, making it very easy for visitors to combine a safari in Botswana with a visit to the Mother City. Malaria is prevalent in the northern part of the country, so visitors are advised to consult their doctor prior to travel regarding taking suitable malarial precautions. The national language of Botswana is Setswane, but the official language, that is spoken widely throughout the country, is English. The currency is the Pula (P) which is made up of 100 Thebe – but most of the lodges will quote and charge in US Dollars (US$). Thinking of a holiday to Botswana? If you would like to get some personal help and guidance on your trip from one of our experienced travel consultants then you can ask us to help plan and book your trip.